Today’s post comes from Explainer Valerie Oppenheim. A common question here at The Corning Museum of Glass is something like this: “If you look at really old windows, a lot of times the bottom of the glass is thicker than the top. Does that mean that the glass has melted over the course of many years and that it has settled at the bottom?” Many people are under the impression that this idea is true. But, I am here to tell you that this idea is actually a very common misconception. Allow me to explain. Older window glass is thicker at the bottom due to how it was made. Often, window glass was formed from what we call crown glass. Crown glass starts as a blob of molten glass which is then blown into a huge bubble on the end of the blowpipe. To make crown glass, the gaffer blows a large bubble and flattens the end somewhat. A punty is attached to that flattened end and the bubble is broken off the blowpipe. The gaffer reheats the glass and enlarges the hole left by the blowpipe. 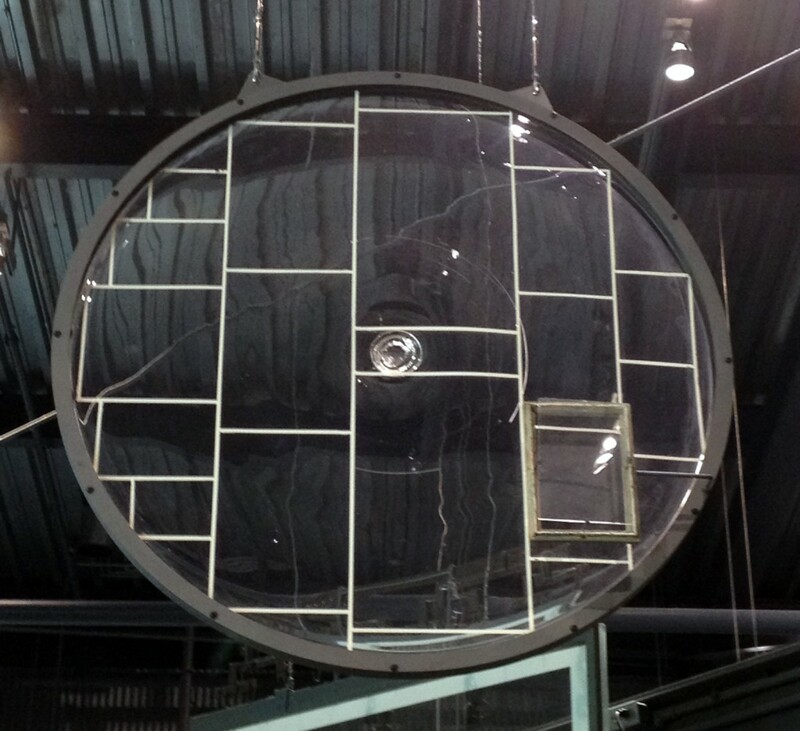 He then very quickly spins the glass and it opens into a giant disk. 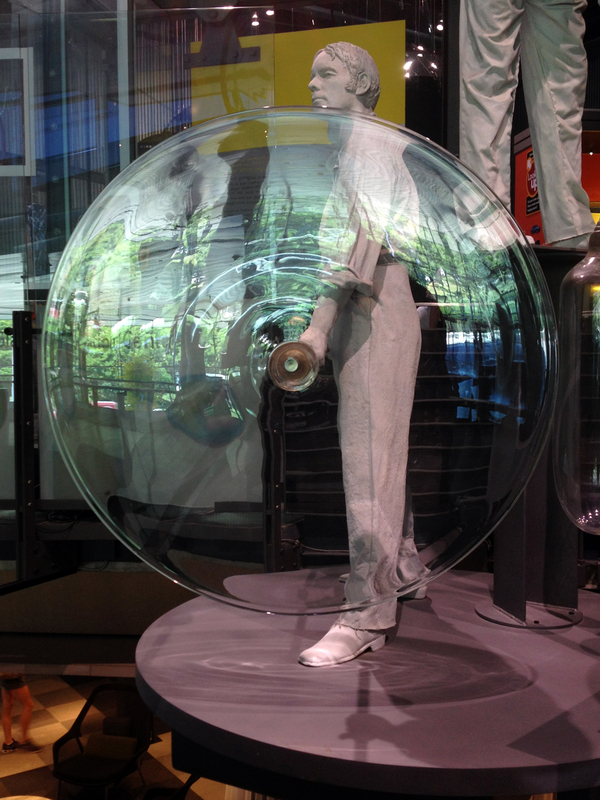 Model of a glassblower spinning a sheet of crown glass in the Museum's Innovation Center. The glass disk is left to cool through the annealing cycle—a cycle in which glass gradually cools down to room temperature. Looking at the flat glass, you can see that it is uneven and rather distorted. You can also see that it is thickest in the middle, around the “bulls-eye” where the punty had been attached. Once the glass has cooled, individual window panes are drawn onto the surface, then cut from it. You can see that the least distorted panes are near the edges, where the glass is the thinnest. As the panes are cut closer to the center, the pieces get thicker. 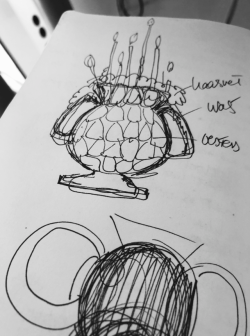 An example of crown glass with panes drawn on it in the Museum's Innovation Center. After doing some research because so many people do believe that window glass melts over the years, scientists were able to come up with an accurate answer to this question. They figured out that, at room temperature, it would take the glass millions of years to flow downwards even at microscopic amounts. The glass is thicker at the bottom, not because of melting over the years, but due to the way it was cut from the larger piece. 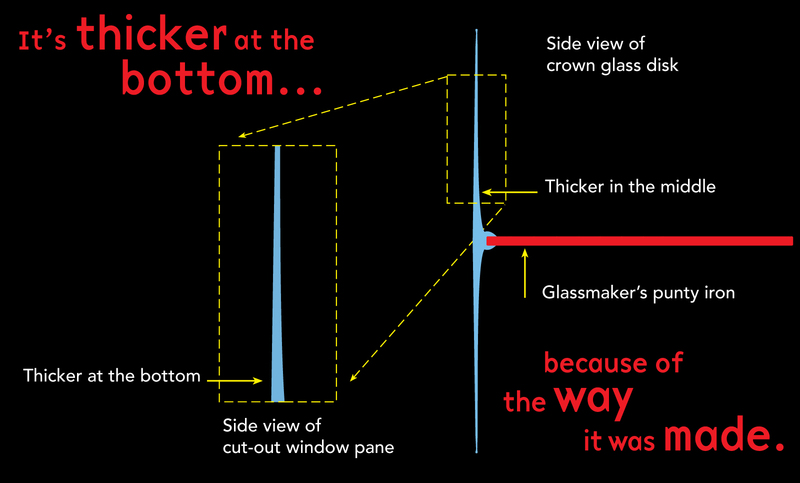 So, you can now understand that when windows are put together, typically, the thicker part of the glass is installed at the bottom (this increases the window’s stability), leading many people over the course of many years to believe that the glass started to melt and flowed to the bottom, when in actuality, it is all about how the windows were made. More information on the viscosity of glass can be found in Dr. Robert Brill’s article Does Glass Flow? CMoG Teens are the Museum’s teen volunteers, Junior Scientists, Explainers, Junior Curators, and Teen Leadership Council (TLC). 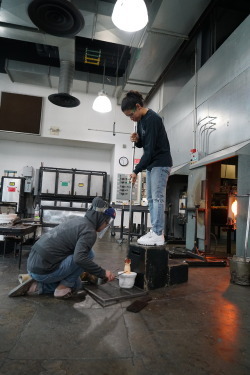 You’ll find them at the Museum during the summer providing hands-on experiences and answering questions about glass and glassmaking, and during the school year learning about the science and art of glass. How about a discussion of glass blowers that made blown light bulbs before that process was automated and were paid on a piece-work basis. They were called “Snowbirds” and the reason for that name is fascinating. I heard this term when I visited with the president of the American Flint Glass Workers Union while doing research in their archives.